On Sunday the BCS match-ups will be released, with Oregon’s opponent in the Fiesta Bowl (this, of course is assuming the Ducks make it, which at this point is a 99.9% certainty) likely being either the Kansas State Wildcats or the hated Sooners of Oklahoma. Both are formidable foes, but the biggest opponent Oregon will face this bowl season will be much closer to home. For Oregon to finish the season strong at 12-1, they must not defeat themselves. The next month will undoubtedly be rife with Chip Kelly-to-the-NFL talk, as rumors heat up that he is headed to the Philadelphia Eagles. Let’s face it Duck fans…he is in all likelihood gone. 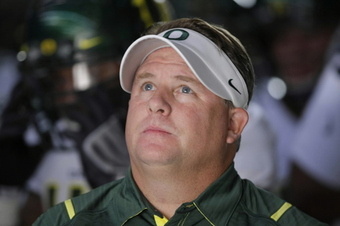 At this point it would be a minor miracle if Chip is back to beat Oregon State AGAIN next season. With that in mind, the players must attack the pre-bowl game prep with one mission in mind, and that is to send the most successful coach in program history out with a bang. With a career record of 45-7, Charles’ successes on the field have been nothing short of mind-boggling. His teams have won games by an average of 22 points per game. His offenses have created stories that will be told for generations to come. The defenses fast and relentless. The special teams…well, no one’s perfect. If Oregon wants to send Chip off to the NFL, they need to take Boomer Sooner behind the woodshed. They need to show Bill Synder’s squad that the best thing they did was back out of the home-and-home. No team aside from Alabama or Georgia (or a hot Stanford team) can hang with Oregon, and those teams all know it. 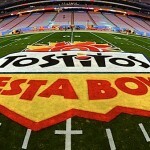 Jump on their foe in the Fiesta bowl early, and it’s good night Irene. Oregon fans, do not bad mouth Chip when he leaves. Do not curse him behind his back, do not burn pictures of him. Embrace what he has done and cherish him for it. The real reason Chip did not leave after last season will never truly be known, but it’s becoming more and more of a thought that Chip wanted to make sure the succession plan was in place before he left, to keep the program humming. Our program. Your program. The program he took to the next level and wants to see stay there. Oregon, practice your butts off and take some hapless Big-12 school to task for even showing up. Then, turn around and thank the man who took the baton and ran with it farther than anyone ever thought. Chip deserves it. The players deserve it. We deserve it.